TLR9 recognizes unmethylated CpG DNA and induces innate immune responses. TLR9 activation is a multistep process requiring proteolytic cleavage and trafficking to endolysosomal compartments for ligand-induced signaling. However, the rules that govern the dynamic subcellular trafficking for TLR9 after pathogen uptake have not been established. In this study, we demonstrate that uptake of Aspergillus fumigatus conidia induced drastic spatial redistribution of TLR9 to the phagosomal membrane of A. fumigatus-containing phagosomes but not to bead-containing phagosomes in murine macrophages. Specific TLR9 recruitment to the fungal phagosome was consistent using A. fumigatus spores at different germination stages and selected mutants affecting the display of Ags on the fungal cell surface. Spatiotemporal regulation of TLR9 compartmentalization to the A. fumigatus phagosome was independent of TLR2, TLR4, and downstream TLR signaling. Our data demonstrate that the TLR9 N-terminal proteolytic cleavage domain was critical for successful intracellular trafficking and accumulation of TLR9 in CpG-containing compartments and A. fumigatus phagosomal membranes. Our study provides evidence for a model in which A. fumigatus spore phagocytosis by macrophages specifically induces TLR9 recruitment to A. fumigatus phagosomes and may thereby mediate TLR9-induced antifungal innate immune responses. Mammalian TLRs detect microbial products and initiate immune responses to infection. The different members of the TLR family recognize and signal to a broad range of microbial ligands, such as bacterial and fungal cell wall components, bacterial lipoproteins, and bacterial and viral nucleic acids (1). The nucleic acid-sensing TLRs, TLR3, 7, 8, and 9, are localized to intracellular compartments, whereas TLR1, 2, 4, 5, and 6 are expressed at the plasma membrane (2). TLR activation and signal transduction are regulated by subcellular compartmentalization of receptors and downstream signaling components (3), and the intracellular localization of nucleic acid-sensing TLRs appears to facilitate self versus nonself discrimination (4). The subcellular localization of TLR9, which engages and signals to unmethylated CpG DNA, is tightly regulated and receptor activation is a multistep process. TLR9 is translated into the endoplasmic reticulum (ER) in its mature, full-length form and then passes through the Golgi to the endolysosomal compartment where the ectodomain is proteolytically cleaved to generate a functional receptor (5, 6). In the endolysosomal compartment, ligand binding to preassembled TLR9 dimers induces a conformational change that allosterically initiates signal transduction (7). While the truncated form of TLR9 can be found in the endolysosomal compartment of unstimulated cells (5), several reports have indicated that TLR9 trafficking is a highly regulated, dynamic process (8–11). The extent to which there is dynamic movement of TLR9 between subcompartments and the underlying processes regulating TLR9 trafficking remain poorly understood. Alhough the best known ligand for TLR9 is unmethylated bacterial and viral CpG-rich DNA, TLR9 has also been implicated in antifungal defense (12, 13). A role for TLR9 in host defense against Aspergillus fumigatus has been suggested by experiments in murine models for invasive pulmonary aspergillosis and allergic bronchopulmonary aspergillosis (ABPA) where TLR9 modulates the innate immune response in the lung (14). A. fumigatus is a common environmental fungus capable of invasive infection in immunocompromised persons and particularly in patients who have undergone allogeneic hematopoietic stem cell transplantation (15). Additionally, A. fumigatus spore forms, including the asexual conidia, can exacerbate allergic and asthmatic disease (16). Evidence for the importance of innate immune mechanisms in fungal defense is mounting. The fungal β-glucan receptor dectin-1 is essential in pulmonary defense against A. fumigatus (17) and collaborates with TLR2 and TLR4 in providing critical immune signals (12, 18–20). Although most studies have focused on the importance of TLR2 and TLR4 in defense against A. fumigatus, a polymorphism study associated increased susceptibility to ABPA with a polymorphism in the TLR9 gene (21), and intranasal CpG had a therapeutic effect during established murine fungal asthma (22). However, the cell biological processes underlying TLR9-mediated A. fumigatus immune responses are still largely unresolved. TLR9-mediated recognition of A. fumigatus DNA by human and murine cells induced proinflammatory cytokines (23), but the intracellular processes that enable A. fumigatus Ag recognition by TLR9 in professional APCs remain uninvestigated. To gain insight into the intracellular fate of TLR9 when immune cells are exposed to A. fumigatus conidia, we investigated the spatiotemporal regulation of TLR9 compartmentalization after phagocytosis of A. fumigatus conidia by murine macrophages. We found that the presence of A. fumigatus phagosomes resulted in a dramatic change of the subcellular distribution of TLR9 to a bright, ring-shaped compartment around the A. fumigatus conidia. TLR9 recruitment was specifically induced by A. fumigatus- but not bead-containing phagosomes, indicating that the composition of the phagocytosed content dictates recruitment of TLR9 to the phagosomal membrane. We demonstrated that A. fumigatus-induced TLR9 recruitment was independent of A. fumigatus spore germination stage. Expression of TLR2, TLR4, and the TLR signaling adaptors MyD88 and TRIF were not required for successful A. fumigatus phagosomal TLR9 recruitment. Further investigation of the requirements for proper intracellular trafficking of TLR9 revealed that the TLR9 N-terminal proteolytic cleavage domain was critical for accumulation of TLR9 in CpG-containing compartments and A. fumigatus phagosomal membranes. All products used for cell culture were from Invitrogen (Carlsbad, CA). The CpG phosphorothioate oligodeoxynucleotide 1826 (5′-TCCATGACGTTCCTGACGTT-3′) with Alexa Fluor 647 conjugated to the 3′ end was purchased from Integrated DNA Technologies (Coralville, IA). OVA Alexa Fluor 488 conjugate (O34781) was purchased from Invitrogen. Dynasore and bafilomycin A1 (BafA) were purchased from Sigma-Aldrich (St. Louis, MO). RAW 264.7 (RAW) and HEK293T cells were purchased from American Type Culture Collection (Manassas, VA) and cultured according to the supplier’s recommendations. Immortalized bone marrow macrophage cell lines derived from wild-type (WT), TLR2/TLR4-deficient, and MyD88/TRIF-deficient mice were a gift from Douglas Golenbock (University of Massachusetts Medical School, Worcester, MA). Immortalized macrophage cell lines were cultured and phenotypically characterized by analysis of macrophage surface marker expression and cytokine expression profile as described previously (24). The lentiviral pHAGE vector containing CD82 fused at the C terminus to mRFP1 was described previously (25). The retroviral pMSCV vector containing murine TLR9 fused at the C terminus to GFP (pMSCV-TLR9-GFP) and plasmids encoding VSV-G and Gag-Pol were gifts from Hidde Ploegh (Whitehead Institute for Biomedical Research, Cambridge, MA). The TLR9 deletion mutant lacking residues 441–470 fused at the C terminus to GFP (pMSCV-TLR9Δ441–470-GFP) was generated from the pMSCV-TLR9-GFP vector by using QuikChange XL site-directed mutagenesis (Agilent Technologies, Santa Clara, CA) using the following primers: 5′-ACG CTG TCA GAA GCC ACC CCT GAA GAG TGT AAG AAC TTC AAG TTC AAG TTC ACC ATG GAC-3′ (forward) and 5′-CCG AGA CAG GTC CAT GGT GAA CTT GAA GTT CTT ACA CTC TTC AGG GGT GGC TTC-3′ (reverse). The final construct sequence was confirmed by sequencing. Lentivirus production and transduction were performed as described previously (25). Retroviral transduction was performed as described (8). Briefly, HEK293T cells were transfected with plasmids encoding VSV-G and Gag-Pol, as well as pMSCV-TLR9-GFP or pMSCV-TLR9Δ441–470-GFP. At 24 h and 48 h after transfection, medium containing viral particles was collected, filtered through a 0.45-mm membrane, and added to RAW macrophages or immortalized macrophages. The next day, cells were given fresh media, and antibiotic selection in 5 μg/ml puromycin was initiated. The A. fumigatus strain 293 was a gift from Elefterios Mylonakis (Massachusetts General Hospital, Boston, MA). The A. fumigatus mutant strain ΔrodA (26) was a gift from Jean-Paul Latgé (Institut Pasteur, Paris, France), and the alb1 mutant strain (27) was a gift from K.J. Kwon-Chung (National Institute of Allergy and Infectious Diseases, National Institutes of Health, Bethesda, MD). A. fumigatus strains were plated on Sabouraud dextrose agar plates supplemented with 100 μg/ml ampicillin and grown at 30°C for 3–5 d. Conidia were dislodged from plates by gentle scraping and resuspension in PBS. After two washes in ice-cold PBS, conidia were stored in PBS at 4°C for use within 4 wk or immediately heat-killed at 100°C for 30 min in a heating block. Swollen conidia were prepared by incubation in RPMI 1640 at 37°C for 6 h. Resting conidia, swollen conidia, and hyphal forms were distinguished by microscopy. To detect surface β1,3-glucan exposure, conidia were then stained with an anti–β-glucan Ab specific for β1,3-glucan (Biosupplies, Parkville, Australia) diluted 1/200 in 2% BSA/PBS for 1 h on a rotator and washed three times with PBS. Then conidia were stained for 1 h at room temperature with anti-mouse Alexa Fluor 488 (Invitrogen) diluted 1/500 into 2% BSA/PBS. A. fumigatus conidia were fluorescently labeled by selectively linking Alexa Fluor 647 succinimidyl ester reconstituted in dimethylformamide (100 mg/ml) to primary amines located on the conidial surface. After three PBS washes, conidia were suspended in 500 μl PBS, and 3 μg dye was mixed with the pathogen at 37°C for 30 min while shaking for 10 s every 10 min. The dye-pathogen mixture was then washed again three times in PBS and kept on ice and protected from light until imaging experiments. Spinning-disk confocal microscopy was performed on a Nikon Ti-E inverted microscope equipped with a CSU-X1 confocal head (Yokogawa, Sugar Land, TX) that provides scan speeds of up to 2000 frames per second. A Coherent, 4 W, continuous-wave laser (Coherent, Santa Clara, CA) was used as an excitation light source to produce excitation wavelengths of 488, 568, and 647 nm. To acquire high-quality fluorescence images, a high-magnification, high-numerical aperture objective, used for total internal reflection fluorescence imaging, was used (Nikon, 100×, 1.49 numerical aperture, oil immersion). A piezo stage (Prior Instruments, Rockland, MA) capable of X, Y, Z movement was used for z-stack acquisition. A halogen light source and an air condenser (0.52 numerical aperture) were used for bright field illumination. A polarizer (Nikon, MEN51941) and Wollaston prisms (Nikon, MBH76190) were used to acquire differential interference contrast (DIC) images. Images were acquired using an EM-CCD camera (Hamamatsu, C9100-13) capable of acquiring high-resolution images under low light levels with high quantum efficiency. Emission light from the sample was collected after passage through the appropriate emission filters (Semrock, Rochester, NY). Image acquisition was performed using MetaMorph software (Molecular Devices, Downingtown, PA). Imaging was performed on cells plated in complete medium into chambered coverglass (Lab-Tek/Nunc; Thermo Scientific, Rochester, NY) in a temperature-regulated environmental chamber (In Vivo Scientific, St. Louis, MO). Unless noted specifically, experiments were conducted with the A. fumigatus 293 WT strain. After three washes in PBS, A. fumigatus conidia were introduced to the cells at a 5:1 ratio and live cell imaging was started immediately. Flash far-red–labeled beads (1 and 5 mm; Bangs Laboratories, Fishers, IN) were washed three times in PBS, introduced to the cells at a 10:1 ratio, and incubated for 16 h. For phagocytosis inhibition experiments, cells were preincubated with 100 μM Dynasore (Sigma-Aldrich) under serum-free conditions for 30 min. Subsequently, cells were coincubated with conidia in the presence of Dynasore under serum-free conditions for 30 min. After washout, cells were kept in complete medium. For CpG trafficking experiments, CpG-Alexa Fluor 647 (1 μM) and/or OVA-Alexa Fluor 488 (100 μg/ml) were mixed in prewarmed medium and added to the cells. After 8 min of incubation, cells were washed twice and time-lapse imaging was started. The data are representative of at least three independent experiments in which a minimum of 100 cells were visualized. Raw image data files were processed using Adobe Photoshop in accordance to the ethical guidelines for scientific image manipulation as proposed by Rossner and O’Donnell (28). Quantitative colocalization analysis was performed in Volocity version 5.3.2.0 using the colocalization module that computes Pearson’s correlation and Manders’ coefficient for the region of interest. Pixels chosen for quantitative analysis were those that lie in a circumferential ring on the equatorial plane of the phagosome. Pixels that may be associated with vesicles were excluded. We studied the effect of phagocytosis of A. fumigatus resting conidia on the subcellular localization of TLR9 using a stable RAW macrophage cell line expressing TLR9-GFP. As we have previously shown that the tetraspanin CD82 is recruited from the endolysosomal compartment to A. fumigatus and Cryptococcus neoformans phagosomes but not to polystyrene bead-containing phagosomes (K. Artavanis-Tsakonas, P.V. Kasperkovitz, E. Papa, M.L. Cardenas, A.G. Van der Veen, H.L. Ploegh, and J.M. Vyas, submitted for publication), we stably coexpressed CD82-mRFP1 in these cells for use as a marker of endolysosomal and A. fumigatus phagosomal compartments. We found that the presence of A. fumigatus phagosomes dramatically changed the subcellular distribution of TLR9 from its typical pattern of ER and endolysosomal distribution (5, 8–10, 29) to a bright, ring-shaped compartment around the A. fumigatus conidia that colocalized with CD82 (Fig. 1A). To demonstrate that the recruitment of TLR9 and CD82 was uniform throughout the phagosomal membrane, we imaged serially the entire volume of the phagosome and observed robust recruitment throughout (Supplemental Video 1). Additionally, RAW cells expressing either TLR9-GFP or CD82-mRFP1 alone demonstrated similar recruitment as cells expressing both fluorescent proteins (data not shown). To ensure that the A. fumigatus conidia were found within intracellular compartments, we used surface labeling of the fungal pathogen with Alexa Fluor 647 (Fig. 1A). DIC images and fluorescent images confirmed that A. fumigatus conidia resided in phagosomes (full Z-stack shown as a movie can be found in Supplemental Video 2). Addition of the fluorescent label to A. fumigatus did not affect its ability to recruit CD82 or TLR9 (data not shown). In sharp contrast to A. fumigatus conidia, phagocytosis of a polystyrene bead, regardless of size, did not result in enrichment of TLR9 or CD82 around the bead (Fig. 1B), indicating that recruitment of TLR9 is not a result of uptake itself but is specifically induced by the content of the phagosome. Uptake of A. fumigatus conidia by macrophages that had previously been exposed to polystyrene beads resulted in specific enrichment of TLR9 and CD82 only around the A. fumigatus conidia but not around the bead (Fig. 1C). The merged images of TLR9 and CD82 showed close apposition of the ring-shaped signals around the A. fumigatus phagosome, confirming that these two proteins are found on the phagosomal membrane. Using time-lapse imaging, the associations remained close throughout the time imaged (data not shown). To determine the extent of overlap of TLR9-GFP and CD82-mRFP1, isolated images of a phagosome were subjected to statistical analysis (Fig. 1D). Pixels capturing fluorescence intensity around the phagosomal membrane were isolated and subjected to quantitative analysis. The identical 387 pixels were included for analysis for both the CD82-mRFP1 and TLR9-GFP signals. Pixels that may be associated with the nearby vesicles were excluded for this analysis. The Pearson’s correlation for this image was 0.54 and the Manders’ coefficients were Mx of 0.97 and My of 0.99. These data indicate that TLR9-GFP and CD82-mRFP1 are colocalized on the membrane of the A. fumigatus-containing phagosome. 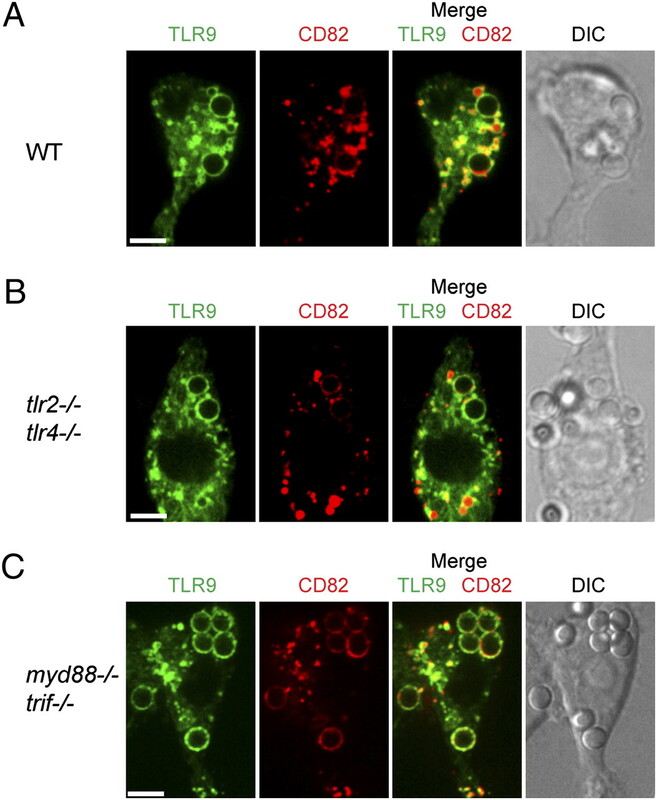 A. fumigatus phagosomes specifically induce recruitment of TLR9. A–D, Confocal microscopy of RAW macrophages expressing TLR9-GFP (green) and CD82-mRFP1 (red). One focal plane is shown. Scale bar, 5 μm. Original magnification ×100. A, Phagosomes containing A. fumigatus resting conidia acquire both TLR9 and CD82. RAW cells were incubated with A. fumigatus resting conidia labeled with Alexa Fluor 647 (blue) for 1 h. Colocalization of TLR9 and CD82 in the phagosomal membrane is apparent in the merged image (third panel) (see also Supplemental Video 1). The DIC image and the merged DIC/A. fumigatus (blue) image demonstrate the presence of two labeled A. fumigatus conidia within the cell (see also Supplemental Video 2). 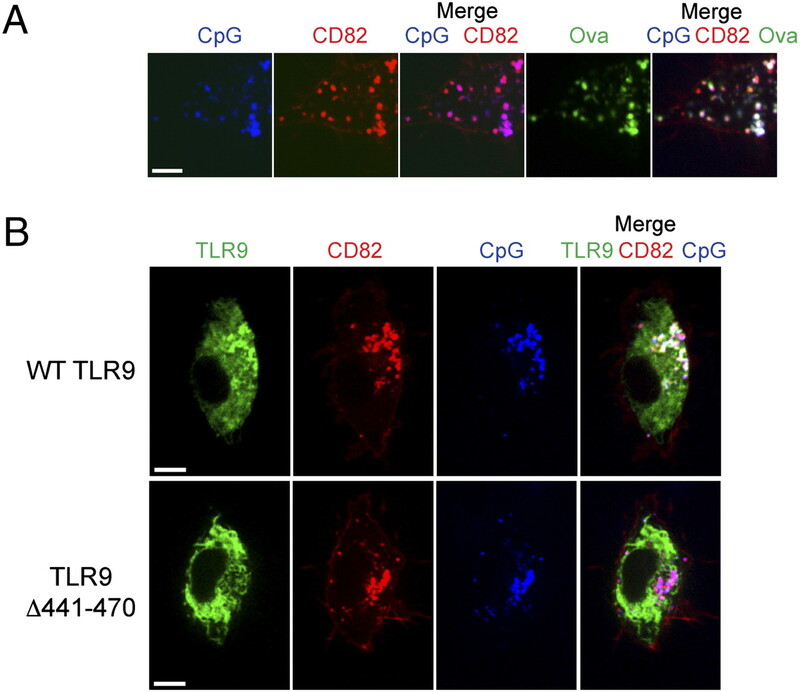 B, Bead-containing phagosomes fail to acquire TLR9 and CD82. RAW cells were incubated for 16 h with Flash far-red–labeled 5-mm beads (blue). C, TLR9 is specifically recruited to A. fumigatus-containing phagosomes in cells that have taken up both A. fumigatus resting conidia and polystyrene beads. RAW cells were incubated for 16 h with Flash far-red–labeled 5-mm beads (blue) and then exposed to unlabeled A. fumigatus resting conidia for 1 h. The DIC image demonstrates the presence of unlabeled A. fumigatus conidia within the cell. D, Colocalization of TLR9 and CD82 in an A. fumigatus-containing phagosomal membrane. A detail of a representative cell having taken up an A. fumigatus resting conidium was quantitatively analyzed. Pixels associated with large vesicle (10 o’clock position) and two smaller vesicles (4 o’clock position) were excluded from this analysis. Phagocytosis was observed as soon as 10 min after exposure of RAW cells to A. fumigatus conidia. We investigated the pathway by which uptake was mediated by pretreatment of the cells with Dynasore, a cell-permeable small molecule that reversibly inhibits the GTPase activity of dynamin1, dynamin2, and Drp1 (30). In the presence of 100 μM Dynasore, macrophage uptake of A. fumigatus conidia was inhibited, although the conidia still adhered to the plasma membrane (Fig. 2A). Using time-lapse imaging, we studied the kinetics of conidial uptake and recruitment of TLR9 and CD82 after reversal of inhibition by washout (Fig. 2B). Phagocytic activity was restored 15 min after Dynasore washout, and recruitment of TLR9 and CD82 was seen after 45 min. Maximal levels of recruitment were reached 1 h after washout (Fig. 2C). Phagocytosis of A. fumigatus conidia is dynamin-dependent and induces TLR9 recruitment within 45 min. A–C, Confocal microscopy of RAW macrophages expressing TLR9-GFP (green) and CD82-mRFP1 (red). One focal plane is shown. Scale bar, 5 μm. Original magnification ×100. A, The dynamin inhibitor Dynasore blocks uptake of A. fumigatus conidia and polystyrene beads. RAW cells were pretreated with 100 μM Dynasore for 30 min before being exposed to A. fumigatus resting conidia (unlabeled) and 1 μM fluorescent polystyrene beads (blue). The presence of Dynasore did not interfere with adherence of conidia and beads to the plasma membrane. 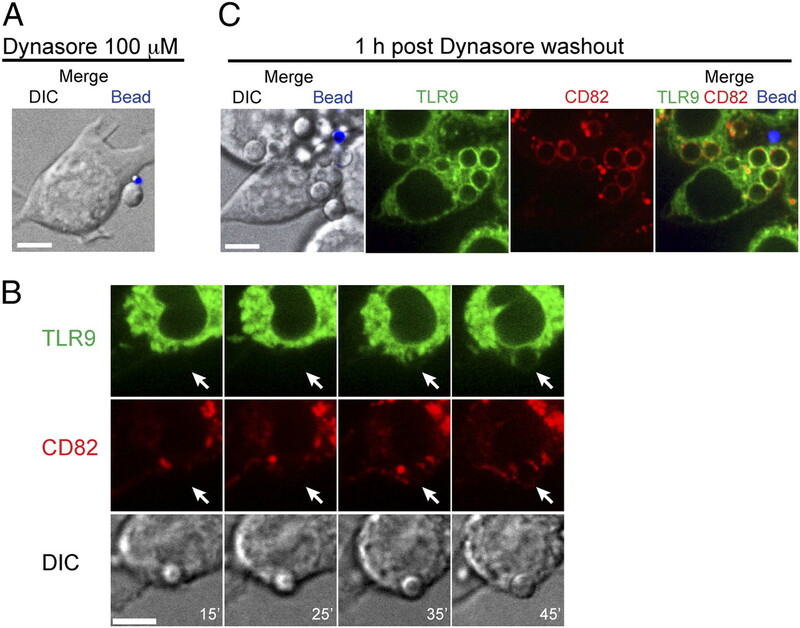 B, A. fumigatus phagosomes acquire TLR9 and CD82 within 45 min after reversal of dynamin inhibition by Dynasore washout. Time-lapse images were acquired at time points in minutes after washout as indicated in the DIC panels. The white arrows in the red and green channels show the site of A. fumigatus conidial entry. C, Potent recruitment of TLR9 and CD82 to A. fumigatus phagosomes is reached 1 h after Dynasore washout. The merged image on the right shows a representative cell having taken up five unlabeled A. fumigatus resting conidia and one extracellular 1-μm polystyrene bead. Because our bead experiment demonstrated that TLR9 phagosomal recruitment is specific to A. fumigatus conidia, we next wanted to investigate whether the ability to induce TLR9 recruitment was related to conidial surface properties that change throughout the different A. fumigatus spore stages. During the spore germination process, A. fumigatus conidia undergo an initial period of isotropic expansion associated with the uptake of water, and upon the establishment of a polarity axis, a short germ tube emerges and grows into a hypha (31). Conidial swelling during germination increases surface exposure of fungal β-glucans that can trigger the induction of inflammatory responses through the β-glucan receptor Dectin-1 and allow macrophages to distinguish between A. fumigatus spore stages (18, 32–34). To prevent conidial swelling and increased β-glucan exposure from occurring during our experimental conditions, we heat-killed dormant conidia immediately at 100°C for 30 min. When we exposed cells to these heat-killed conidia, recruitment of TLR9 was not impaired (Fig. 3A) compared with what we had seen for conidia that were dormant but viable. Induction of conidial swelling in RPMI 1640 for 6 h prior to introduction to the cells had no effect on phagocytosis and TLR9 recruitment (Fig. 3B). To confirm that spore germination was induced by this swelling procedure, we microscopically examined the conidia and observed an increase in size (data not shown). Additionally, we stained the conidia for β1,3-glucan and, in agreement with previously described findings (33, 34), we detected low levels of β1,3-glucan on dormant conidia, whereas ∼90% of swollen conidia displayed increased β1,3-glucan levels (Supplemental Fig. 1). Heat-killing did not affect β-glucan exposure (Supplemental Fig. 1). Thus, our results indicate that TLR9 recruitment by A. fumigatus conidia occurs independently of spore germination stage. Strikingly, after overnight incubation with conidia that were dormant but viable at the time of introduction to the cells, we occasionally observed intracellular hyphal forms that retained the ability to recruit TLR9 (Fig. 3C, Supplemental Video 3). Because a low proportion of phagocytosed A. fumigatus conidia can survive, and germinate, within cells (35), it is unclear whether germination occurred intracellularly after phagocytosis of the conidia or if the hyphae were phagocytosed after germination. We next examined whether removal of the hydrophobic surface layer on dormant conidia that masks their recognition by the immune system would augment TLR9 recruitment. When we exposed cells to dormant conidia from an A. fumigatus mutant rodA−/− strain lacking the hydrophobic RodA protein that is covalently bound to the conidial cell wall through GPI remnants (26), we did not see a change in the level of TLR9 recruitment (Fig. 3D). Additionally, the conidial pigment melanin protects conidia from oxidative damage by leukocytes and modulates the response to A. fumigatus conidia by shielding fungal pathogen-associated molecular patterns (36). To determine whether the absence of melanin would affect TLR9 recruitment, we exposed RAW cells to the A. fumigatus mutant alb1−/− strain (27) (Fig. 3E). Taken together, although our bead experiment demonstrated that recruitment of TLR9 to the phagosome is dependent on a signal specific to the A. fumigatus conidia, the signal required for TLR9 recruitment appears to be continuously present throughout the different spore stages and selected A. fumigatus mutants. TLR9 recruitment is independent of A. fumigatus spore viability, germination stage, surface hydrophobin, and pigment. Confocal microscopy of RAW macrophages expressing TLR9-GFP (green). One focal plane is shown. Scale bar, 5 μm. Original magnification ×100. WT A. fumigatus resting conidia were either heat-killed immediately or swollen for 6 h and heat-killed. Resting heat-killed A. fumigatus conidia (A), swollen heat-killed conidia (B), and A. fumigatus hyphae (C) retain the ability to recruit TLR9 (see also Supplemental Video 3). Absence of the hydrophobic surface protein RodA (D) or the conidial surface pigment melanin (E) does not interfere with phagosomal TLR9 recruitment by A. fumigatus resting conidia. As TLR2 and TLR4 have been implicated to be critical in the immune response to A. fumigatus (reviewed in Ref. 37) and these receptors are readily recruited from the plasma membrane to microbial phagosomes (38), we hypothesized that the induction of recruitment of TLR9 by A. fumigatus was mediated by signals derived from surface-expressed TLR2 or TLR4 during phagocytosis. To test this hypothesis, we expressed TLR9-GFP and CD82-mRFP1 in immortalized bone marrow macrophage cell lines. As expected, WT cells behaved identically as RAW cells (Fig. 4A). Interestingly, when we used cells deficient in both TLR2 and TLR4, phagocytosis of A. fumigatus conidia and subsequent recruitment of TLR9 and CD82 were not affected (Fig. 4B), indicating that expression of TLR2 and TLR4 is not required for induction of recruitment. To investigate whether downstream signaling from any of the TLR family members was involved in relaying the signal that induces TLR9 recruitment, we next used cells deficient in both MyD88 and TRIF. In these cells, which are completely incapable of all TLR signaling, we still observed robust recruitment of TLR9 and CD82 (Fig. 4C). Thus, our results indicate that TLR9 redistribution to the A. fumigatus phagosome is independent of TLR signaling. Expression of TLR2 and TLR4 and downstream TLR-signaling are not required for TLR9 recruitment. A–C, Confocal microscopy of immortalized bone marrow-derived macrophages expressing TLR9-GFP (green) and CD82-mRFP1 (red). One focal plane is shown. Scale bar, 5 μm. Original magnification ×100. Cells were incubated for 1 h with A. fumigatus resting conidia. 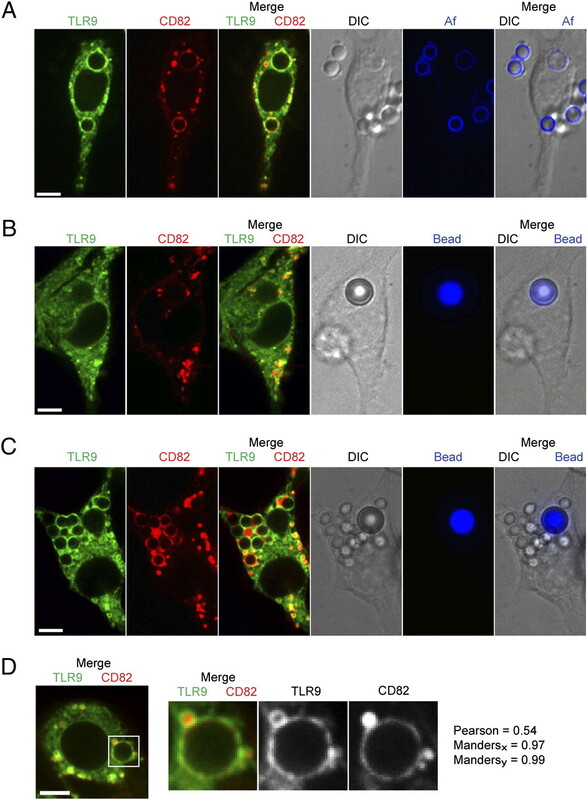 Representative cells showing phagosomal acquisition of TLR9 and CD82 are shown in WT macrophages (A), TLR2/TLR4-deficient macrophages (B), and TLR-signaling incompetent MyD88/TRIF-deficient macrophages (C). Biochemical experiments have demonstrated that the full-length form of TLR9 must undergo proteolytic maturation in the endolysosomal compartment to become a functionally competent receptor to signal in response to CpG (5, 6). We hypothesized that proteolytic cleavage is a requirement for successful TLR9 intracellular trafficking and retention in subcellular compartments. To investigate the role of proteolytic cleavage in TLR9 trafficking to, and retention at, the A. fumigatus phagosome, we pretreated cells with a specific inhibitor of vacuolar-type H+-ATPase, BafA. Interestingly, when we exposed these cells to A. fumigatus resting conidia, TLR9 recruitment to the A. fumigatus phagosome was impaired although not completely absent (Fig. 5A). In agreement with our previous data (K. Artavanis-Tsakonas et al., submitted for publication), recruitment of CD82 was not affected by BafA. There was still some overlap between the TLR9 and CD82 signal in the A. fumigatus phagosomal membrane and in endolysosomal compartments. These data suggested that phagosomal acidification and TLR9 proteolytic cleavage were involved in successful TLR9 recruitment to the A. fumigatus phagosome. To eliminate the involvement of any other cellular effects of BafA treatment, we constructed a GFP fusion with a deletion mutant that lacks TLR9 residues 441–470. This mutant has been shown to be uncleavable but appeared to have no gross structural alteration in protein structure (6). Strikingly, TLR9Δ441–470 appeared to be exclusively localized to the ER (Fig. 5B). We detected no TLR9Δ441–470 in the A. fumigatus phagosomal membranes, whereas CD82 recruitment occurred normally. There was no overlap between the CD82 and TLR9Δ441–470 signals anywhere in the cell, and the phagosomal membrane contained exclusively CD82. Because these data demonstrated that the presence of the N-terminal cleavage site was required for accumulation of TLR9 in A. fumigatus phagosomal membranes, we next examined whether TLR9 translocation to CpG-containing endolysosomal compartments also required proteolytic cleavage. Translocation of TLR9 from the ER to CpG-containing lysosomal compartments has been demonstrated in various cell types (8, 9, 11). Because we saw robust colocalization of TLR9 and CD82 in A. fumigatus phagosomal membranes, we hypothesized that CD82 also intersects the CpG/TLR9 trafficking pathway in the endolysosomal compartment. When we incubated CD82-mRFP1–expressing RAW cells with fluorescent CpG, we found that CpG was endocytosed into a CD82-negative compartment and rapidly redistributed to a CD82-positive compartment (Fig. 6A, first three panels). Within 30 min all CpG was found in CD82-positive compartments that costained with lysosomal markers such as OVA (Fig. 6A, last two panels) and other lysosomal markers such as DQ-OVA and LysoTracker (data not shown). To verify that the CpG/CD82 compartment is the site where TLR9 is recruited, we expressed TLR9-GFP and CD82-mRFP1 in RAW cells and exposed these cells to fluorescent CpG. As anticipated, we observed rapid recruitment of TLR9 to CpG-containing, CD82-positive compartments (Fig. 6B). In stark contrast, TLR9Δ441–470 was not recruited to CpG-containing compartments although CpG trafficking to CD82-positive compartments occurred normally (Fig. 6B). There was no overlap between the CD82 and TLR9Δ441–470 signals anywhere in the cell, and all TLR9Δ441–470 remained in a distinct pattern indicative of the ER. Although we cannot know whether the deletion mutant TLR9Δ441–470 fails egress from the ER or retention after translocation to post-ER compartments, the absence of the N-terminal cleavage site clearly prevents accumulation of TLR9 in the endolysosomal/phagosomal compartments containing either CpG and/or A. fumigatus. Therefore, our data demonstrate that TLR9 proteolytic cleavage is a requirement for successful intracellular trafficking and subcellular compartmental retention. TLR9 accumulation in A. fumigatus phagosomes requires the TLR9 N-terminal proteolytic cleavage motif. A and B, Confocal microscopy of RAW macrophages. One focal plane is shown. Scale bar, 5 μm. Original magnification ×100. A, Blockage of proteolytic cleavage with BafA results in impaired TLR9 recruitment. RAW cells expressing CD82-mRFP1 (red) and WT TLR9-GFP (green) were pretreated with 100 nM BafA or DMSO vehicle control for 2 h and then exposed to resting A. fumigatus conidia. BafA treatment results in impaired recruitment of TLR9 but not CD82, whereas both TLR9 and CD82 recruitment are not affected by the vehicle control (shown by white arrow). The black arrow shows the phagocytosed conidium in DIC image. B, TLR9Δ441–470 is not recruited to A. fumigatus-containing phagosomes. RAW cells expressing CD82-mRFP1 and TLR9Δ441–470-GFP were incubated with resting A. fumigatus conidia. TLR9Δ441–470 fails to accumulate on the A. fumigatus-containing phagosome, whereas CD82 recruitment is unaffected (shown by white arrow). The black arrow shows the phagocytosed conidium in DIC image. TLR9 accumulation in CpG-containing compartments requires the TLR9 N-terminal proteolytic cleavage motif. A and B, Confocal microscopy of RAW macrophages. One focal plane is shown. Scale bar, 5 μm. Original magnification ×100. A, CpG is redistributed to a CD82-positive endolysosomal compartment within 30 min. RAW cells expressing CD82-mRFP1 (red) were incubated with 1 μM CpG-Alexa Fluor 647 (blue) and OVA (green) for 8 min and then medium was replaced. The merged image shows colocalization of CpG (blue), OVA (green), and CD82 (red) after 30 min. B, TLR9Δ441–470-GFP fails to be recruited to CpG-containing compartments. CD82 intersects the TLR9 trafficking pathway and marks the site where WT TLR9 is recruited. RAW cells expressing CD82-mRFP1 (red) and WT TLR9-GFP (green, first panels) or TLR9Δ441–470-GFP (green, second panels) were incubated with 1 μM CpG-Alexa Fluor 647 (blue) for 8 min and medium was replaced. The merged image shows that 1 h after CpG addition WT TLR9 has accumulated in CpG/CD82-positive compartments, whereas TLR9Δ441–470 still displays an ER-like distribution. The merged image shows no overlap between TLR9Δ441–470 and the CpG/CD82 double-positive compartment. The importance of TLR9 trafficking to endolysosomal compartments for receptor functionality and ligand-induced signaling has been well documented (5–9), but exactly how these processes are integrated into the dynamic cellular infrastructure in which TLR9 operates after pathogen uptake has not been established. We have now demonstrated that TLR9 is specifically redistributed to the phagosomal membrane of A. fumigatus spore-containing phagosomes but not bead-containing phagosomes. The TLR9 N-terminal proteolytic cleavage site was a critical requirement for TLR9 recruitment to A. fumigatus phagosomes. Although TLR9 has been implicated in host defense against A. fumigatus (12, 14), the intracellular processes that enable A. fumigatus Ag recognition by TLR9 in innate immune cells remain unclear. To our knowledge, this report is the first to demonstrate that TLR9 specifically accumulates at the fungal phagosome. Selective compartmentalization of pattern recognition receptors to the phagosome may be a requirement for effective orchestration of antifungal innate immunity. TLR9 recruitment to phagosomes was dependent on the content of the phagosome. Indeed, polystyrene beads failed to recruit TLR9 to the phagosomes to levels detectable by fluorescence microscopy. However, the presence of TLR9 in phagosomes has been shown in latex bead-containing RAW cells using biochemical methods (5, 39). Despite the presence of functional TLR9 in latex bead-containing phagosomes, conjugation of beads with CpG did not result in visible enrichment of the total amount of phagosomal TLR9 (5). In sharp contrast, A. fumigatus induced robust recruitment of TLR9 to its phagosome. Moreover, in cells where both A. fumigatus and polystyrene beads were taken up, a clear difference in the level of TLR9 could be visualized. By live cell imaging, we were able to determine that this recruitment occurred within minutes and remained present on the phagosome for hours. Phagocytosis of A. fumigatus conidia has been shown to require actin polymerization and PI3K activity (40). By using Dynasore, a reversible inhibitor of endocytic pathways that blocks coated vesicle formation, we have now demonstrated that GTPase activity of dynamin is an essential step in A. fumigatus conidial phagocytosis. A similar requirement for dynamin activity has been demonstrated for cell entry of the intracellular parasite Trypanosoma cruzi (41) and active invasion by Toxoplasma gondii (42). While dynamin activity was essential for phagocytosis of both A. fumigatus conidia and beads, TLR9 recruitment after phagocytosis was specific to A. fumigatus conidia. We hypothesized that TLR9 redistribution to A. fumigatus-containing phagosomes involved signaling through another receptor, possibly a plasma membrane-localized receptor responding to a component on the A. fumigatus conidial surface. Multiple pattern recognition receptors besides TLR9 have been implicated in the innate immune response to A. fumigatus (12, 18–20, 43–45). A link between the TLR2-mediated recognition of A. fumigatus and the phagocytic response has been suggested (34), and internalization of TLR2 with the A. fumigatus phagosome was shown by microscopy (44). In our search for the receptor mediating the specific recruitment, we demonstrated that expression of TLR2 and TLR4 was not required for A. fumigatus phagosomal TLR9 recruitment. Additionally, TLR9 recruitment occurred normally in the absence of both TLR adaptors MyD88 and TRIF, thereby eliminating the involvement of all downstream TLR signaling in the recruitment process. Our data did not show that deficiency in any of the molecules we analyzed resulted in impaired phagocytosis. Experiments demonstrating recognition of β1,3-glucan on the A. fumigatus cell wall have suggested that the immune response is tailored toward metabolically active conidia (18, 32) due to preferential recognition by dectin-1 of A. fumigatus swollen conidia that have increased β1,3-glucan surface exposure (33, 34). However, we observed robust TLR9 recruitment to dormant, heat-killed conidia and did not see a correlation between TLR9 recruitment levels and spore germination stage or increased β1,3-glucan surface exposure. Additionally, alterations of the fungal cell wall using mutants of RodA or melanin synthesis did not perturb the recruitment of TLR9 to the A. fumigatus phagosome. These data suggest that a cell wall component present throughout all developmental stages may mediate TLR9 recruitment. The fungal cell wall is a complex and dynamic structure that contains proteins, glycolipids, and polysaccharides that are endowed with distinct immunostimulatory capacities (46). Identification of the component responsible for induction of TLR9 recruitment may significantly enhance our understanding of the innate immune pathways that intracellularly orchestrate antifungal defense. Maturation of A. fumigatus phagosomes results from fusion with compartments of the endocytic pathway, and killing of conidia depends on phagolysosome acidification in alveolar macrophages (40). Our data show that the endolysosomal tetraspanin CD82 intersects the trafficking pathway of TLR9 and marks the compartment where CpG and TLR9 interact. 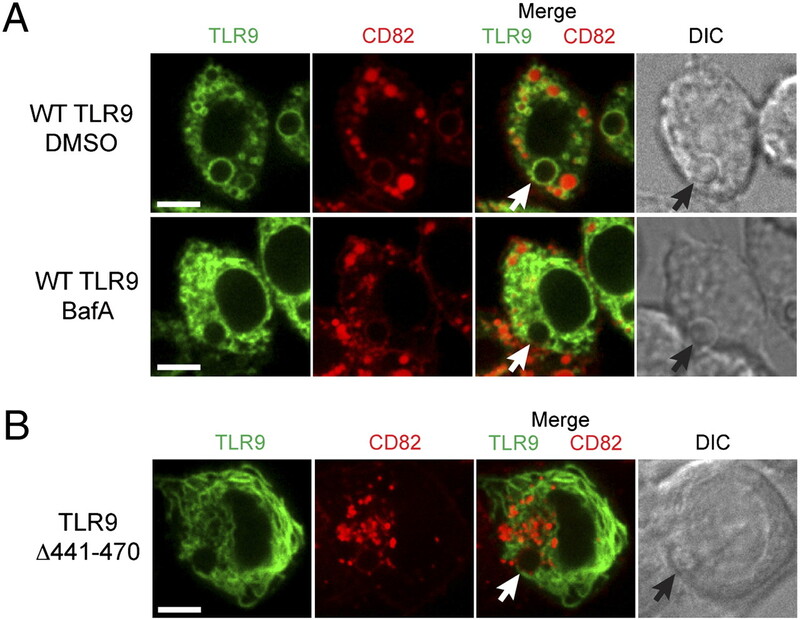 Strikingly, while some TLR9 was already present in the CD82-positive compartment in unstimulated RAW cells, the drastic redistribution of TLR9 to the phagosomal membrane occurred rapidly after A. fumigatus phagocytosis and coincided with recruitment of CD82. It is unclear whether the TLR9 molecules recruited to A. fumigatus-containing phagosomes pass through the endolysosome or translocate to the phagosome directly from the ER. Occasionally we observed TLR9/CD82-positive vesicles around the phagosomal membrane that suggested codelivery of TLR9 and CD82 to the phagosome (Fig. 1D). However, it is possible that TLR9 can reach the A. fumigatus phagosome by both pathways. Multiple factors have been implicated in TLR9 targeting to subcellular compartments. Delivery of TLR9 to endolysosomal compartments required its interaction with the ER-resident protein UNC93B1, mediated through the transmembrane segment of TLR9 (8). Cytoplasmic targeting motifs controlled TLR9 intracellular localization (47), and the addition of an N-terminal FLAG tag precluded TLR9 ER egress and proteolytic cleavage (5). The importance of the N-terminal cleavage site in TLR9 has been established for its role to generate the functional signaling-competent receptor (5, 6). We have now extended the requirement for the TLR9 N-terminal proteolytic cleavage site for TLR9 accumulation in the endolysosomal and phagosomal compartments. It is unclear whether the trafficking defect of the mutant is due to its failure to exit the ER or lack of retention in the endosome or phagosome after translocation. Because successful cleavage of TLR9 required an acidic compartment, it is tempting to speculate that uptake of A. fumigatus conidia and subsequent phagosomal acidification (40) may facilitate cleavage and retention in the phagosome. A recent report indicated that acidification induced by carbohydrates from encapsulated microbes facilitated TLR9 signaling (48). TLR9 recruitment, cleavage, and retention at the fungal phasosome may be prerequisite steps for successful signaling to TLR9 ligands that are released during phagosomal processing. 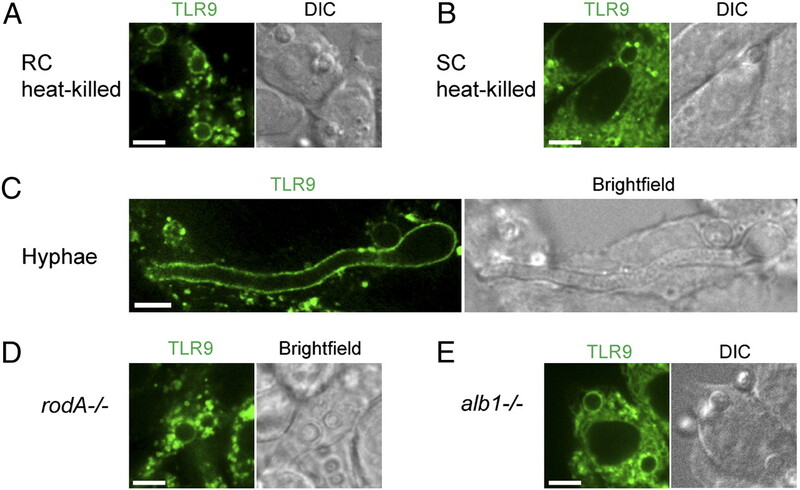 Biochemical analyses on A. fumigatus-containing phagosomes are required to resolve the exact spatiotemporal relationship between phagosomal acidification, TLR9 recruitment, and TLR9 cleavage. Our study provides evidence for a model in which A. fumigatus spore phagocytosis by macrophages induces TLR9 recruitment to A. fumigatus phagosomes and may thereby mediate TLR9-induced antifungal innate immune responses. As isolated A. fumigatus nucleic acids activated TLR9 (23), phagosomal TLR9 recruitment may function to enable an immediate response to microbial content released during processing in the phagosome. A similar mechanism has been proposed for T. cruzi (49). Another possibility is that A. fumigatus spores contain as yet unidentified ligands for TLR9, as the discovery that malarial hemozoin acts as a direct ligand for TLR9 demonstrated that TLR9 activation is not limited to nucleic acids (50). Given the frequent incidence of invasive pulmonary aspergillosis in immunocompromised patients and severe complications associated with ABPA, it is clear that understanding the molecular mechanisms responsible for triggering innate immune responses to A. fumigatus has both clinical and therapeutic potential, particularly in terms of vaccine development. We thank Douglas Golenbock, Hidde Ploegh, Eleftherios Mylonakis, Jean-Paul Latgé, and K.J. Kwon-Chung for providing us with reagents and Lynda Stuart and David Askew for critically reading the manuscript. This work was supported in part by National Institutes of Health Grant K08 AI-057999 (to J.M.V.). J.M.V., P.V.K., and M.L.C. were supported by Massachusetts General Hospital Department of Medicine start-up funds. 1997. Innate immunity: the virtues of a nonclonal system of recognition. Cell 91: 295–298.
. 2006. TLR signaling. Cell Death Differ. 13: 816–825.
. 2008. Proteolytic cleavage in an endolysosomal compartment is required for activation of Toll-like receptor 9. Nat. Immunol. 9: 1407–1414.
. 2009. Spatiotemporal regulation of intracellular trafficking of Toll-like receptor 9 by an inhibitory receptor, Ly49Q. Blood 114: 1518–1527.
. 2004. TLRs govern neutrophil activity in aspergillosis. J. Immunol. 173: 7406–7415.
. 2009. Toll-like receptor 9-dependent activation of myeloid dendritic cells by deoxynucleic acids from Candida albicans. Infect. Immun. 77: 3056–3064.
. 2009. Toll-like receptor 9 modulates immune responses to Aspergillus fumigatus conidia in immunodeficient and allergic mice. Infect. Immun. 77: 108–119. 2004. Immunity to fungal infections. Nat. Rev. Immunol. 4: 11–24.
. 2006. Airborne fungal fragments and allergenicity. Med. Mycol. 44(Suppl. 1): S245–S255.
. 2009. Requisite role for the dectin-1 β-glucan receptor in pulmonary defense against Aspergillus fumigatus. J. Immunol. 182: 4938–4946.
. 2006. Dectin-1 and TLRs permit macrophages to distinguish between different Aspergillus fumigatus cellular states. J. Immunol. 176: 3717–3724.
. 2008. Polymorphisms in Toll-like receptor genes and susceptibility to pulmonary aspergillosis. J. Infect. Dis. 197: 618–621.
. 2010. Intranasal CpG therapy attenuated experimental fungal asthma in a TLR9-dependent and -independent manner. Int. Arch. Allergy Immunol. 152: 98–112.
. 2008. Toll-like receptor 9-dependent immune activation by unmethylated CpG motifs in Aspergillus fumigatus DNA. Infect. Immun. 76: 2123–2129.
. 2008. Silica crystals and aluminum salts activate the NALP3 inflammasome through phagosomal destabilization. Nat. Immunol. 9: 847–856.
. 2007. Tubulation of class II MHC compartments is microtubule dependent and involves multiple endolysosomal membrane proteins in primary dendritic cells. J. Immunol. 178: 7199–7210.
. 2009. Surface hydrophobin prevents immune recognition of airborne fungal spores. Nature 460: 1117–1121.
. 1998. The developmentally regulated alb1 gene of Aspergillus fumigatus: its role in modulation of conidial morphology and virulence. J. Bacteriol. 180: 3031–3038.
. 2004. The JCB will let your data shine in RGB. J. Cell Biol. 164: 11–13.
. 2009. TLR9 traffics through the Golgi complex to localize to endolysosomes and respond to CpG DNA. Immunol. Cell Biol. 87: 209–217.
. 2008. Use of dynasore, the small molecule inhibitor of dynamin, in the regulation of endocytosis. Methods Enzymol. 438: 77–93. 2006. Cell polarity in filamentous fungi: shaping the mold. Int. Rev. Cytol. 251: 41–77.
. 2005. The β-glucan receptor dectin-1 recognizes specific morphologies of Aspergillus fumigatus. PLoS Pathog. 1: e42.
. 2005. Aspergillus fumigatus triggers inflammatory responses by stage-specific β-glucan display. PLoS Pathog. 1: e30.
. 2007. Phagocytosis of Aspergillus fumigatus conidia by murine macrophages involves recognition by the dectin-1 β-glucan receptor and Toll-like receptor 2. Cell. Microbiol. 9: 368–381.
. 2003. Aspergillus fumigatus conidia survive and germinate in acidic organelles of A549 epithelial cells. J. Cell Sci. 116: 1579–1587.
. 2010. Aspergillus fumigatus conidial melanin modulates host cytokine response. Immunobiology 215: 915–920.
. 2006. Recognition of fungal pathogens by Toll-like receptors. Curr. Pharm. Des. 12: 4195–4201.
. 2008. Membrane proteomics of phagosomes suggests a connection to autophagy. Proc. Natl. Acad. Sci. USA 105: 16952–16957.
. 2003. Phagocytosis and intracellular fate of Aspergillus fumigatus conidia in alveolar macrophages. Infect. Immun. 71: 891–903.
. 2010. Dynasore, a dynamin inhibitor, inhibits Trypanosoma cruzi entry into peritoneal macrophages. PLoS ONE 5: e7764.
. 2009. Dynamin inhibitor impairs Toxoplasma gondii invasion. FEMS Microbiol. Lett. 301: 103–108.
. 2003. Toll-like receptor (TLR) 2 and TLR4 are essential for Aspergillus-induced activation of murine macrophages. Cell. Microbiol. 5: 561–570.
. 2009. Modulation of Toll-like receptor 2 (TLR2) and TLR4 responses by Aspergillus fumigatus. Infect. Immun. 77: 2184–2192.
. 2002. Toll-like receptor (TLR) signaling in response to Aspergillus fumigatus. J. Biol. Chem. 277: 39320–39326.
. 2006. Cytoplasmic targeting motifs control localization of Toll-like receptor 9. J. Biol. Chem. 281: 35585–35592.
. 2010. Carbohydrate oxidation acidifies endosomes, regulating antigen processing and TLR9 signaling. J. Immunol. 184: 3789–3800.
. 2008. Recruitment and endo-lysosomal activation of TLR9 in dendritic cells infected with Trypanosoma cruzi. J. Immunol. 181: 1333–1344.